A dramatic and uplifting cantata, which presents the Easter story through seven songs and readings. 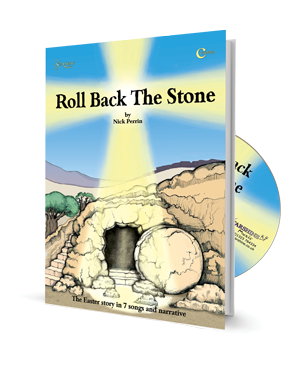 'Roll Back The Stone' makes an unforgettable presentation, ideal for KS2 assembly, choir presentations or Easter service. This compelling piece from Nick Perrin presents the Easter story in seven songs with short linking narratives. Adapted from the popular musical ‘The Gospel Show’, ‘Roll Back The Stone’ conveys brilliant dramatic intensity, through its vivid lyrics and effective use of different musical styles. The cantata opens with a brand new song - ‘Hosanna Jesus’ - that tells of the journey along crowd-lined roads into Jerusalem. 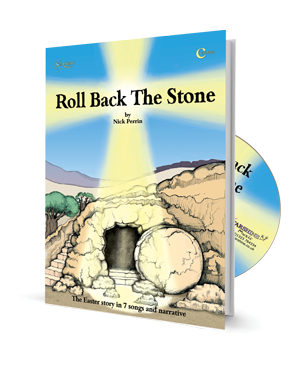 The story then moves on to Judas’ betrayal, the Last Supper, Jesus’ trial, mockery and crucifixion, finishing with the joyful resurrection song ‘Roll Back The Stone’. "Uplifting music which the children loved and found easy to learn. It was a perfect choice for our last chapel service of term. The texts slotted in perfectly - overall it was a good balance of words and music loved by everyone. We'll definitely do it again in the future." A White - School Director of Music, Surrey. It was a pleasure to attend the performance at St Robert’s Church and to see so many of the children from the schools taking part. Easter is a time of celebration and a time for family. The performance brought the school community together and as I am sure those who attended will agree, was a great way to start the countdown to Easter. From the moment the massed choir of all the feeder primaries of St. John Fishers High bounced into the opening number, ‘Hosanna,’ I tingled all over. The students threw themselves heart and soul into belting out the words and performing every action in impressive unison. The confidence of all the soloists – Judas, Jesus and Pilate – from such young students (Jesus was only a Year 5!) was testament both to the huge amount of talent inherent in the primary schools of Harrogate and hard work of Community Arts Director Darren Roberts. In between the music, the story was told by an assortment of readers from the various primary schools. Again, the clarity of diction was excellent. Perhaps the most moving moment was Jesus’ journey to Calvary as he zig zagged through the choir, now playing the hostile crowd. There were tears in the eyes of many audience members as he was pushed and shoved to the ground. As the students sang their final number – Roll Back the Stone- the mood in St. Robert’s church was joyful. Uplifting music which the children loved and found easy to learn. It was a perfect choice for our last chapel service of term. The texts slotted in perfectly - overall it was a good balance of words and music loved by everyone. We'll definitely do it again in the future. Review by Angela Hook - Teacher, East Sussex. Excellent! Good variety of songs and melodies - very in tune with children's musical enjoyment. Well written, child friendly and perfect for our Easter service. I saw this cantata performed by 8 and 9 year olds at St Joseph's Primary Academy and was hugely impressed by the whole thing. To have so many children actively involved in singing and telling a complex Bible story (betrayal, political conundrums) in a simple, understandable way was amazingly clever. Well paced with catchy tunes, it is a winner.